Are you looking for a trouble free life? Don't you think that every time you take the trouble to figure out solutions to your problems, you grow? Those that insulate themselves from troubles often become greatly troubled inside for a lack of something they can't quite define. There's a sense of adventure and accomplishment that goes hand in hand with figuring out solutions to your so-called problems in life. Without these challenges, you wither away and vegetate. Did you ever wonder why the magnitude of world problems are measured in dollar signs? If money solved all problems and brought happiness, then all rich people and all rich countries would be happy and free of any major problems, right? Have you ever felt helpless about all the problems in the world? As an exercise, make a list of all the times in your life when your actions caused a chain of events to take place that affected major changes in another person's life. After looking over your list, you can readily see how you as one person can do a great deal in your lifetime to affect important changes in the world. Now list in a notebook all the creative alternatives that you as a world citizen with your present abilities can do to help correct the problems of pollution (air, food, water & soil), crime, drug addiction, the homeless and poor education without spending hardly any money. Next list in your notebook all the important things that happened to you last week that involved an outlay of money? Next, list in a notebook all the important things that happened to you last week that didn't involve any money at all? 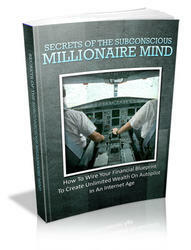 In This Book, you will learn all about the fundamentals of true financial empowerment! Gone are the days of thinking like a poor person's mindset. It is time to change that way of thinking so that you will truly attract wealth in your hands.